One of my all time favorite VFD clocks is the Jenny design from NixieKits.eu. Well, Jürgen Grau has a new version out that is USB powered and is based on the same firmware as the Lena/Lars/Laura clocks. This thing looks awesome. Super Capacitor backup keeps time during power outages for more than 6 hours. This a really nice kit and a very nice VFD. IV-11's are significantly brighter than the orginal and the GPS functions perfectly! IV-15's are beautiful little tubes! LED's auto cycling works a little nicer on the original but certainly not bad. Well worth the bucks! 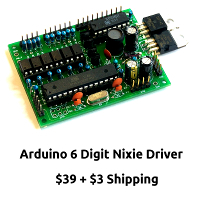 I bought one of these from the nixiekits site at the end of November 2013. Before buying the thing i exchanged several emails with 'Mr Nixie', but as soon as i had paid via paypal, all contact suddenly ceased and any emails i sent were ignored. The phone number appeared to not work. The clock was never shipped, so i had to open a paypal dispute which was also completely ignored. Eventually paypal gave me my money back at the end of December . I have still had no response to any of my attempts to contact nixiekits.